In this robust traditional Irish stew, that is a pub classic, lamb chunks and vegetables are braised in a broth that is spiked with Guinness beer that brings out that dark and robust color and flavor in this Irish Lamb Stew with Guinness. St. Patrick’s Day is almost here and as I was looking through the recipes on my blog, there wasn’t a single recipe that had anything to celebrate St Patty’s Day with. Also I have been seeing so many Irish Stew floating around everywhere on the internet, that I really wanted to make some. Not to go on again about the weather here in Seattle, but we really need some soul warming goodness to get out of this rainy weather funk. So, I looked around and read about Irish stew. Though most of the recipes I saw were with beef, my research showed that traditional Irish Stew that is a pub classic is made with lamb. And, anyway, the meat-a-holic here prefers lamb over beef, so Irish Lamb Stew it is. I went to our local PCC store this morning and picked up everything I needed for the stew. There was one last package of lamb chunks for stew on the shelf ( I could have asked them to cut some for me, but I was in a hurry) and I picked it up. I picked up the Guinness, onions, carrots, beef stock and everything and checked out. As I got to my car, I realized that I forgot to pick up celery. So, in I went again and got that too. So much for getting the shopping done really quickly. I knew I had to start cooking as soon as I got home as this was gonna take a few hours to get done. I didn’t waste any time once I got home and started on this stew. As I was chopping everything to make it, I chopped up a couple of jalapenos on a whim. I know this is not in the traditional Irish stew, but this is my recipe and I am sure the husband would love that extra spicy kick to it. Look how dark that Guinness is! 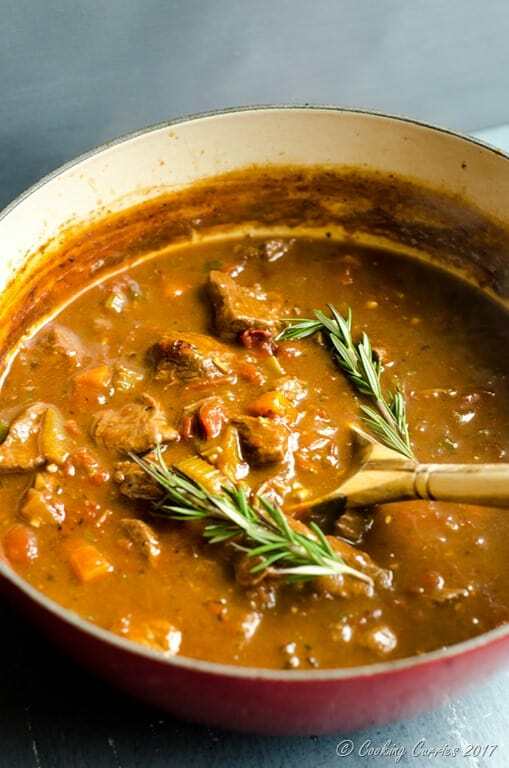 That is what gives this Irish Lamb Stew that deep, dark, rich color. 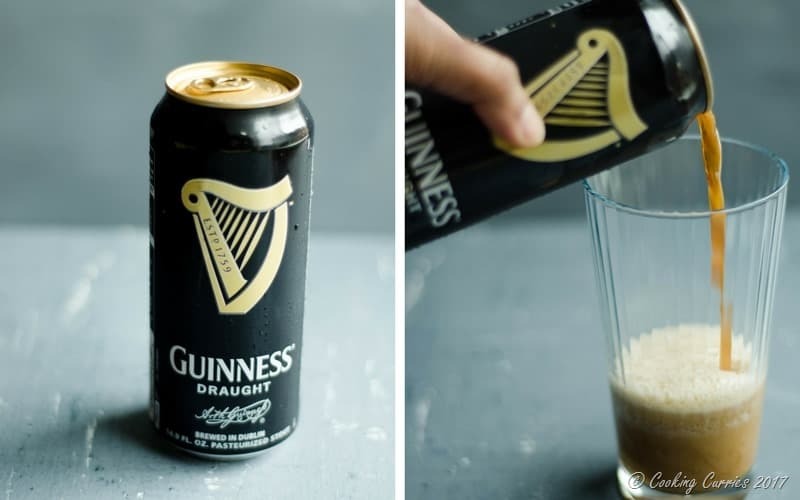 You may use any other beer, but then that wont be Irish stew anymore. Pat dry the lamb cubes and heat the oil in a heavy bottomed pan. Place the meat in a single layer in the pan and salt it. Once it is browned for a few minutes, flip them over and let them brown to a good sear on the other side. Remove them to a plate and repeat with the rest of the meat. The meat will render some fat to the pan. To that fat, add the onion, garlic, celery, carrots and jalapenos. Add salt and crushed black pepper. Once the onions have browned a little, add the flour and let it cook a little till the raw scent of the flour disappears. Add the broth a little and mix the flour into it well without any lumps. Add the rest of broth, the seared lamb, tomatoes and the Guinness to it. Bring it to a boil and let it simmer uncovered for 15-20 mins. Cover and simmer for another hour till the sauce has thickened. 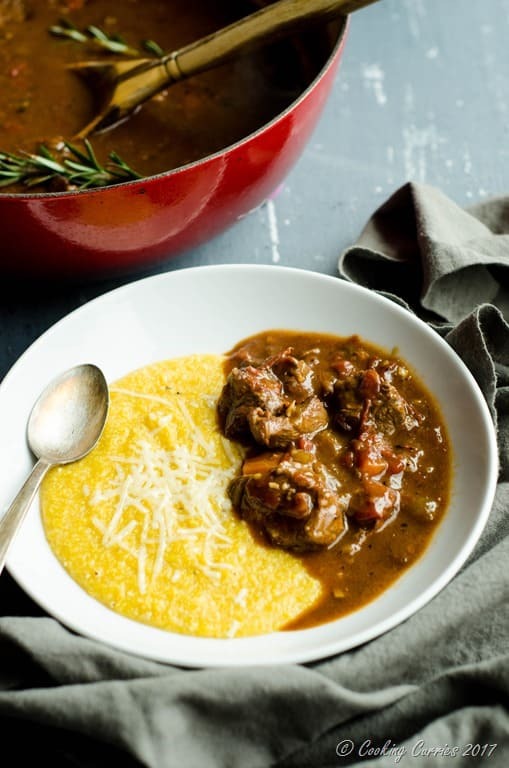 Serve hot with crusty bread or with creamy polenta like I did. 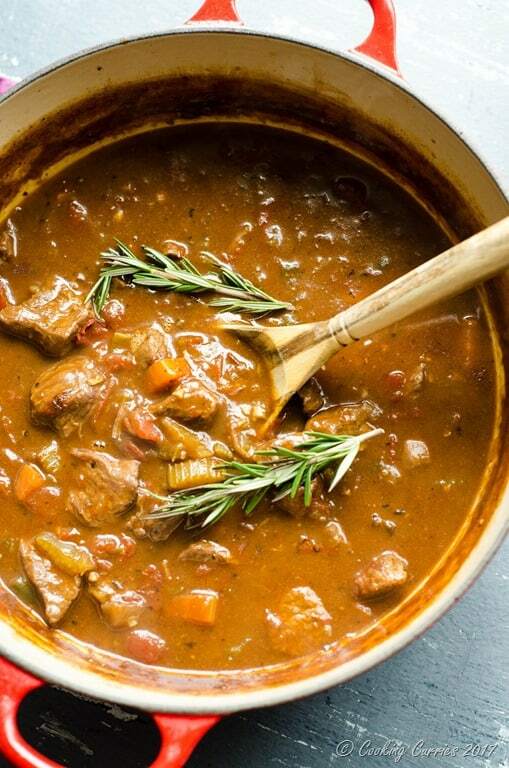 In this robust traditional Irish stew, that is a pub classic, lamb chunks and vegetables are braised in a broth that is spiked with Guinness beer that brings out that dark and robust color and flavor in this stew. What a hearty dish! Love the Guinness pairing. I love lamb, but never know what to do with it. The recipe looks like a perfect place to start! Yes it is, a very simple recipe. Just takes a little time on the stove top, that’s all! This looks and sounds so tasty! 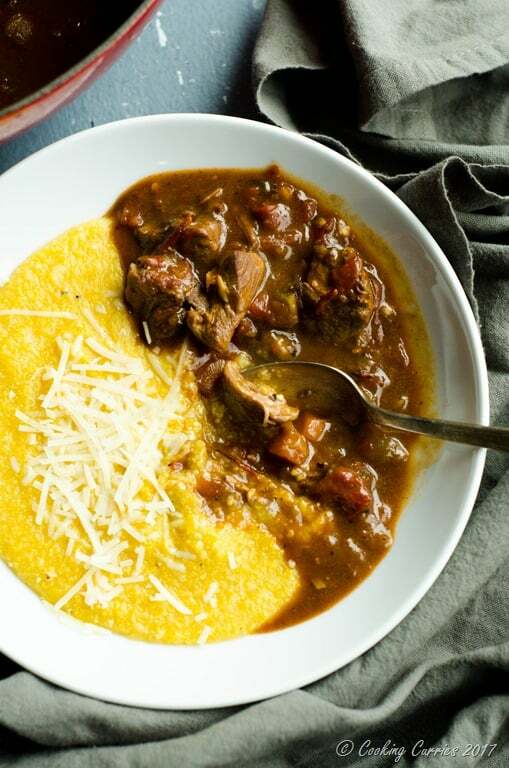 And I LOVE serving stew with creamy polenta — perfect! Yes, I love that combo too! ? 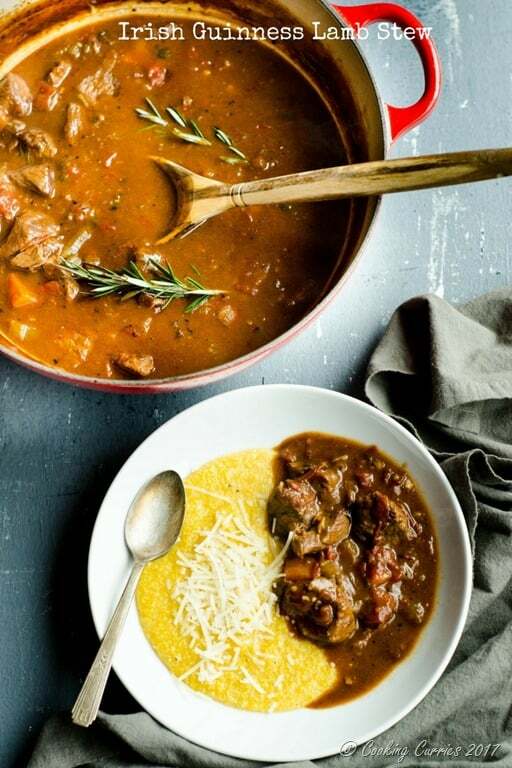 Your photos are so well done that I could taste that Irish lamb stew without reading the recipe! A keeper. am not a lamb fan but this looks so darn delish!! This might be a stupid question but reading the recipe, at what point do you add the seared meat back into the pan? Not stupid at all, looks like I completely missed that! I added that step to the recipe. Thanks for pointing it out, Jennifer. Where does the rosemary come in? It’s pictured but not included in the ingredients. Its not in the recipe per se, just a garnish that I added and then removed before we ate it. my guys loved this-I had ground lamb in freezer I needed to use up & served over left over mashed potatoes. I did have to thicken a little extra, think I’ll cut back on stock next time.